Far from the skipping ropes, pokemon cards and other activities of the playgrounds all over the world, the new trend at the SDC is the Capoeira! According to Wikipedia®, "Capoeira is an Afro-Brazilian martial art that would find its roots in the methods of warfare and in the dances of the African people of the time of slavery in Brazil." 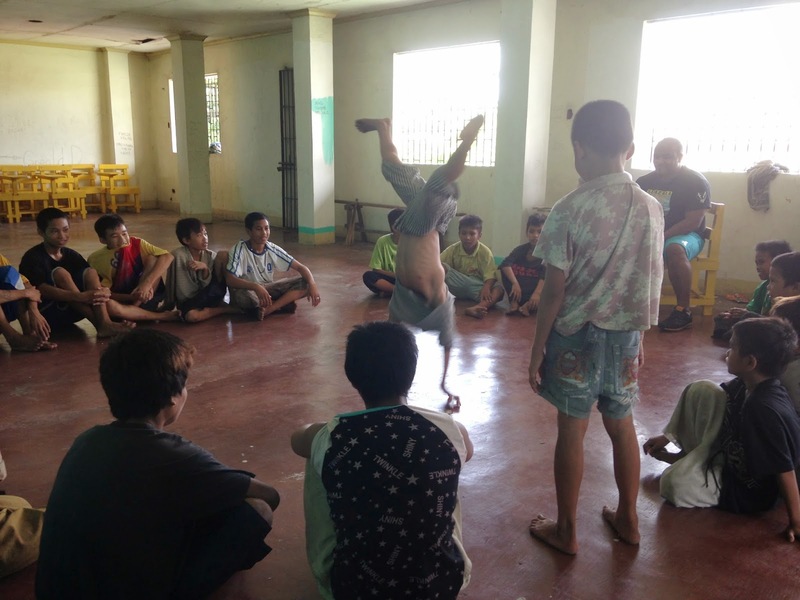 In reality, capoeira is a sport that combines dance, rhythmic movements and combat, and it is a way for our the SDC children to have fun and especially to unwind! On alternate Thursdays, two volunteer teachers come to teach the art of capoeira to young during sessions of one hour and a half. Prof and Kit, owners of Mandala centering place in Bacolod therefore offer their time to mentor twenty children and introduce them to the practice. In addition to capoeira lessons, Prof, whose capoeirista name is “Contra Mestre Parabolica” shares a few minutes at the end of each session to give kids a lesson in good manners, for example, reminding them why it is essential to have good hygiene or the importance of respecting the adults who supervise them at the SDC. Since the launching of the activity at the beginning of 2014, children have shown a real interest in capoeira and invest heavily during each session in order to progress. Periodically, competitions are organized to motivate the kids who now even practice by themselves in the dorms! On November 15th, the Mandala centering place was the scene of a major event, an important gathering of capoeiristas who came straight from Brazil, Malaysia and Singapore. This day was an opportunity for teachers to reward capoeiristas students by the rise in rank. Capoeira grades are represented by ropes of different colors depending on the level. Joel, a children of the SDC who had already distinguished himself as being particularly good at capoeira in recent competitions at the center was invited to attend this event. While he was initially supposed to simply join the group, Joel was finally rewarded by “Contra Mestre Parabolica” who gave him his first grade: yellow and white rope! Joel then got back to the center after a day full of emotions with his rope and his new outfit of capoeirista offered by Prof! Can you imagine a professionnal capoeirista coming from the SDC? Joel with his godfather of capoeira! Weaving in response to Yolanda! Bantayan, a small island belonging to the province of Cebu in the Philippines, was one of the areas most severely affected by the typhoon Yolanda in November 2013. Local populations have suffered severe damage and were left in deplorable conditions! The emergency for these communities was then to find a way to stimulate economic activity and find quickly a new source of revenues. 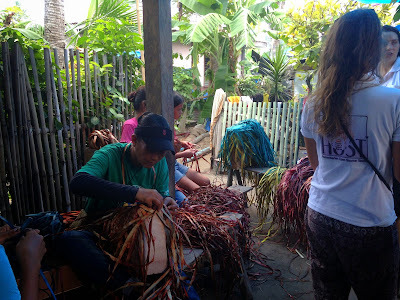 To help them, we got interested in an activity: weaving from pandan (local plant). 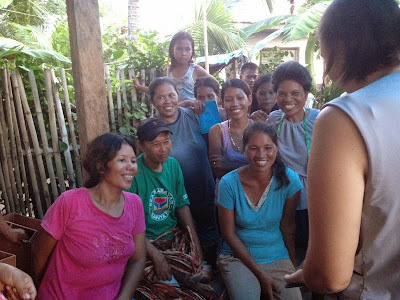 Several women of the island already had basic knowledge allowing them to make place-mats and matting pandan, but unfortunately did not have the financial means to develop this activity. We then deployed the necessary resources to help them! April 2014 At the beginning, we have grouped a dozen motivated women and have provided them with the required materials to manufacture of basic weaving products, to stimulate activity. July 2014 After the reopening of the market and the prospects of development made more concrete, HOST organized a training for weaving bags. Felipe, a specialist of weaving belonging to the Department of Industrial Affairs visited Bantayan to lead a 10-day training for the weavers. Women then acquired new weaving techniques and learned how to dye pandan leaves in order to make colorful bags and baskets. 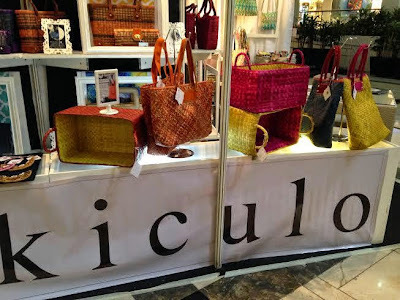 August 2014 Once the activity of weaving bags settled, we approached two retailers based in Bacolod : the brands Kiculo and Vivo that committed to the project by making the bags available to the public. October 2014 The "Bantayan totes" were presented to suppliers around the world during the "Manila Fame," one of the largest fairs in Southeast Asia during which the creations of local artisans are exposed to potential exporters. November 2014 Second training with the aim of improving the quality and developing new weaving techniques to produce different kinds of bags. In just six months, women have gone from very basic weaving products to quality bags! With the training of November, the weavers learned again new techniques of weaving and also techniques of sewing that allow them to make bags more and more sophisticated, and even in line with current trends! During one of our last trips to Bantayan, we collected the poignant testimony of weavers, to better understand how the project has changed their lives. For many, the activity of weaving has increased their daily income by three, allowing them to send their children to school, or to get the electricity in their small habitats. Thereafter, we hope to invite other women to join the project and help other families in Bantayan. 1 year already, Typhoon Yolanda victims still need us! On November 8th, 2013, exactly 1 year ago, Typhoon Yolanda hit the Philippines. On the island of Bantayan, 95% of the infrastructure has been destroyed, leaving people in precarious living and unhealthy conditions. HOST-NGO set up then emergency measures to assist local communities, in visiting a few days later the island on Bantayan to provide food, clean water, medicines, and other first aid kits. - Kubo Concept: Construction of houses built from local materials and constructed to be "typhoon proof". These green homes will help communities without roofs to be aware of organic agriculture and environment. 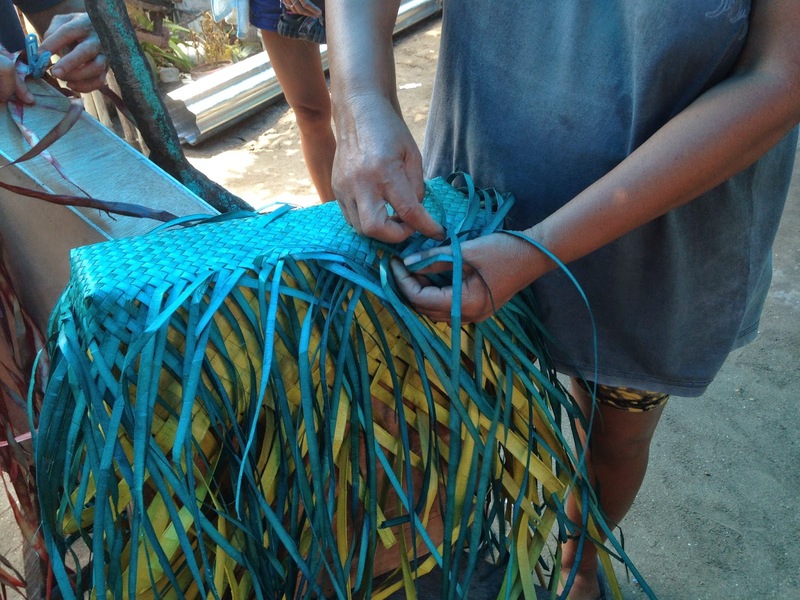 - Weaving Project: Training of a group of women in Bantayan to weave bags from Pandan (local plant). These bags will be sold so that the economic development of the community will be boost. Host intends to implant fair and honesty trade. To continue to carry out these projects and support the development of the victims of Typhoon Yolanda, HOST-NGO needs you! For the first anniversary of Typhoon Yolanda, Global Giving makes every means possible to make this day a real fundraising, so that all the efforts for the reconstruction and conversion of the affected areas can continue. A year after the disaster, damage are still real and efforts are to provide if we want to improve the situation of the Philippines. Yolanda post-reconstruction is not yet completed, many homes are still unhealthy and jobs not converted. To help us, Global Giving make this Saturday, November 8 a day of 100% Matching, and it should last for few days. It means, all the donations you will make to Global Giving for our cause we will be twice more important. For example, for a donation of $ 100, we will get 200$ (to a maximum of $ 500 per donation). This is an exceptional opportunity to get all mobilize to give a second breath for our action ! But the Short Film Corner is also a public place for audiences that come and see movies at the Digital Library (see photo) on individual screens in order to enable them to shortlist and vote their favorite movies they’d have liked. Finally, each participant in the Short Film Corner can organize a screening in one of the three rooms provided purposely. The goal is to initiate a face to face between cinema professionals and film makers and start building common great film opportunities and careers into other festivals or on television. My strongest wish through my film “Life is full” is to reach wider audience in order to raise awareness of the issues that face children in the streets of Bacolod especially those passing in the Social Development Center where HOST-NGO got mobilized to help and protect. Capoeira ! Hold my hands my friend ! Our listening and helping work to these children continues and the deployed energy intensity from the volunteers and partners does not seem to fade out, quite the contrary. Daily work is not easy but hope and passion are still here. Even though resources are sometimes limited, motivation and imagination sometimes can do real miracles. We must show them a way and never falter, these children do trust us and we cannot let them down. There is always a solution and most important is to believe. They are being continuously given attention and consideration from members of the civil society organizations involved in that process of giving them hope and a future. Recently, we were able to provide new sports trainings such as Basketball and Capoeira, coached by appointed and motivated teachers.They love it! A chest activity is being put in place at the center. May the best win! We are striving to trigger any interest from them for particular sport or activity and we are pleasantly surprised to discover real talent among these children. It is very encouraging to see the results achieved in a few sessions! Why nobody did offer them this opportunity before? Of course, playing sports andhaving fun is not enough, although we have improved and intensified School (ALS). Now are 3 half-days a week regardless of their level or age and compulsory for all of them. Don’t make them spoiled! Our team begins work to renovate the main dormitory that will accommodate thirty children now in decent conditions and build an outdoor kitchen made in bamboo and raw material. 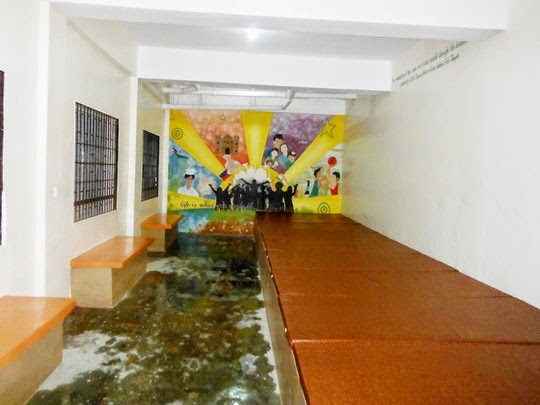 The next step would be to complete the sports room and have the last dorm renovated so that all children can sleep peacefully in a cozy and clean bed. Aside, we pursue other previous activities like hygiene and medical check-up, waste management, organic garden, sanitation awareness, fellowship, values lecture … and so on. We are also working on a dance, music and cooking training school ... One of them may become the new tomorrow starand nobody will remember where she/he came from ... except him/herself. There is joy and no snow for Christmas ! A house is the only thing I need now ! 4 months after the hit of Yolanda typhoon, our team which helps in Bantayan Island, has to sadly acknowledge the evidence of insufficient government’s support which is coming drop by drop to the victims. Right now, the survivors don’t have their house repaired or rebuild yet. We have conducted several community meetings with affected inhabitants and obviously the major problem remains the same. How to finance the construction of their home, while the economy is recovering very slowly and who will support the work and overseeing the development there? Fortunately after some weeks of conceptualization our team responsible for the design of a typhoon resilient and affordable native house and has finally come up with a model that can meet the constraints and requirements of the project’s challenges. We call this concept KUBO whose particularity iscombining a house made of local and raw materials (bamboo, limestone, coconut lumbers, pandan, coconut rope … and an “Agri-tecture” garden to provide a source of incomes with vegetables for sale and for personal food at a hand distance. A KUBO house unit might cost around PHP 50, 000 (USD1200) materials and handy labor works, given it would be cheaper if the purchaser aids to construct. 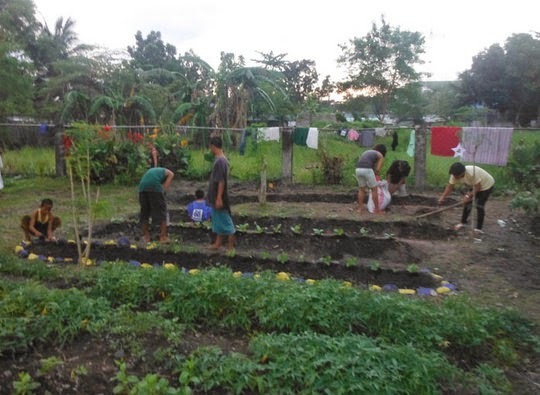 We do not encourage donation but micro -finance in order to reinvest the repayments to finance another KUBO house development and also to actively maintain the sense of ownership of the beneficiaries and have limitation of dependency. Financial assistance to purchasers would be around PHP 20,000 (USD 460). The PHP 30,000 remaining will be collected within a biweekly repayments worth of PHP400 ... borrowing rate will be reduced to a minimum to cover essentially the costs of supervision, tools purchase and training. Therefore the house will be fully paid in more or less 5 years. As of now, we have also received donations to cover the exceptional recovery assistance of income-generating activities (pandan leaves weaving, gardening, breeding, canteens foods). Without the revival of economic activity among its families, return to "normal" life of the entire community is not possible. Today,emergency NGOs are no longer there so that is the real survival time which really begins now. 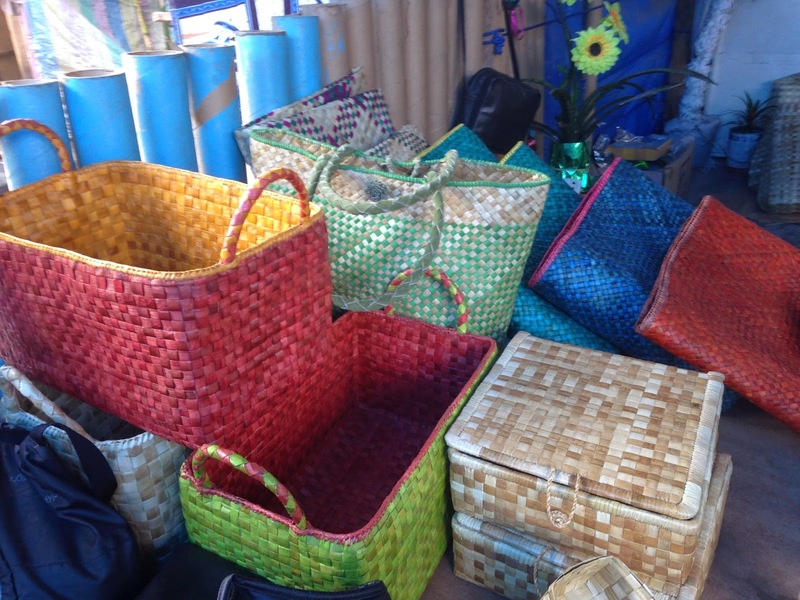 A group of 10 chosen women will now benefit from the pandan weaving re-launching program activities which are including financial assistance, training and marketing support from ANP organization. That would surely help them to become autonomous within a working year. As a preliminary bill of materials details, our current donations received through the generous donors of Global Giving should enable it to finance as a beginning8 houses to be built in the affected areas... And a prototype house in order to validate the concept and overall costs estimation of the KUBO under construction process. He have 3 identified areas as targeted areas, Purok Okoy and Pooc in Santa Fe municipality and one really remote in Mambacayao Diot Island from Bantayan municipality. A big thank you to all the volunteers who has tirelessly been working to find a solution of innovative home and tailored to local and post- disaster contexts typhoon and for their commitment to help the victims to overcome the typhoon damages and economic poverty. 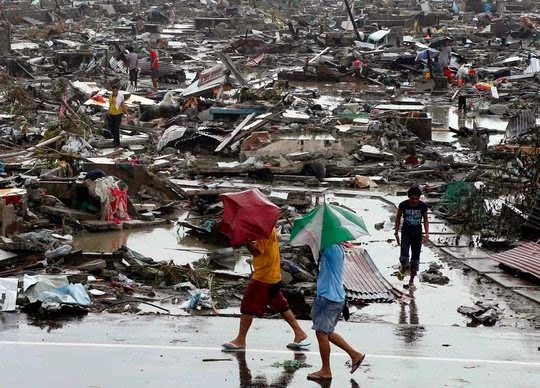 In the aftermath of the strongest typhoon ever hiting the Philippines, we would probably find more and more children and their families living in the streets again. For those who luckily survived this calamity, the path to a brighter future is not already over ... warm thoughts to the filipino nation during that time of disaster suffering. We haven't forgotten you ! Indeed, the SDC children have been benefiting from many improvements. In addition to maintaining the activities that we have already implemented, we have helped to renovate and equip a dormitory which can now accommodate more healthily more or less twenty children (the youngest in priority) . We build colorful concrete beds and benches, made 9 twin bed size washable foam mattresses, put mosquitos screens and doors and finally repainted all the dorm in friendly colors coming along with a beautiful mural painting. That latters would surely give them more energy to develop theirs ideas to how to ponder their future. 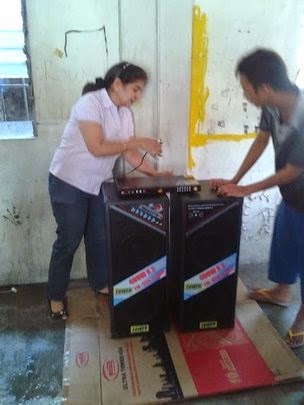 This dynamic support and active solidarity, thanks to the help of the City of Bacolod and local private partners , the center has been equipped with seven brand new showers and led lights in every rooms powered by panels solar. However, it remains further efforts and resources to be provided in order to complete the rehabilitation of the remaining damaged dormitories, especially the one for girls, and the creation of a kitchen and dining room. According to the future donations that we can raise, we would also like to allow a steady supply of hygiene and health items to the children, medical check-up and continue the educational and physical sports activities which will have undoubtedly a very positive impact on their behaviors and values acceptance. New dormitory for having seet dreams ! Doc, I don't feel well but I want to go school ! Can I go and wash my room ?